The Dodgers’ new owners have made some nice moves, some intriguing moves and some absolutely blockbuster moves since they took over last May. The return of Sandy Koufax. Koufax will officially join the organization this season as a special advisor to team chairman Mark Walter. He is scheduled to attend a portion of spring training to work with pitchers and consult with the team throughout the year. There is no more historic and beloved Los Angeles Dodger than Koufax, the greatest pitcher in team history, if not baseball history. He was their first true Los Angeles superstar after the team relocated to L.A. from Brooklyn in 1958. The soft-spoken Koufax is a legendary baseball figure, but his presence goes beyond the advice he can administer to young pitchers. He adds not only a significant link to the team past but also an aura of class and respect and a championship edge. He was a World Series champion four times and a three-time unanimous Cy Young winner. He threw four no-hitters, struck out more than 300 batters in a season three times (including a team-record 382 in 1965) and had a 0.95 postseason ERA. Koufax, 77, has worked with the team in spring training sporadically through the years. Living in Vero Beach, Fla., he served as a spring training advisor for 11 seasons through 1989. He separated himself from the organization while it was owned by Fox, which also owned publishing companies that wrote about his private life. He has made spring training appearances in recent years, but this is the first time he’s been welcomed back in an official capacity. 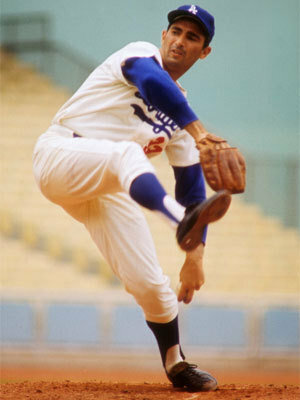 Koufax is the youngest player ever elected to the Hall of Fame. He retired at age 31 because of elbow arthritis, after what most consider the most dominant six-year run in history (2.19 ERA, 0.97 WHIP, 9.4 strikeouts per nine innings, 129-47 record with 115 complete games).